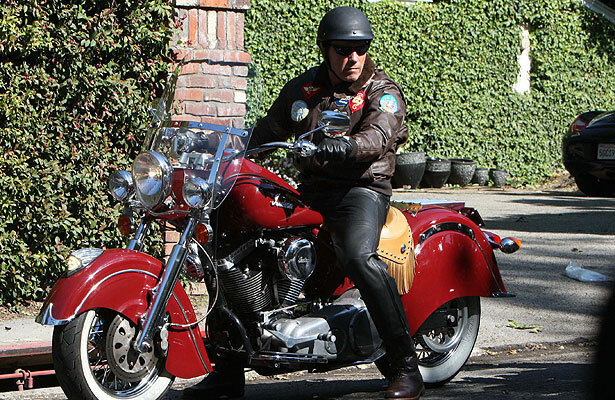 The troubled Arnold Schwarzenegger was spotted riding his motorcycle in Malibu on Memorial Day weekend -- "Terminator" style, in a black leather jacket, but he steered clear of estranged wife Maria Shriver. Meanwhile, the former First Lady of California tweeted her appreciation for veterans and their families on Memorial Day. "This weekend, I'm thinking of all who gave their life, and all the families who lost a loved one, in service to this great country," she wrote. "You have our deepest gratitude and respect. God bless." Shriver also shared some words of wisdom with her followers. "My daughter once gave me a great Plato quote that said, 'Be kind, for everyone you meet is fighting a hard battle.' I love that. So true." She added: "We don't know what is going on inside of most people. On this Memorial Day, when so many are grieving in obscurity or silence, let's keep that in mind." Schwarzenegger and Shriver's oldest son, Patrick, 17, enjoyed some quality time at the family's Malibu house on Saturday, according to his Twitter page.